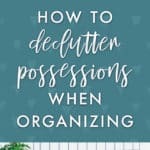 What would it take to get your life decluttered and organized? That might be a tall order for many of us, but the truth is, we could do it in bursts and spurts, using a handful of easy-to-follow rules. 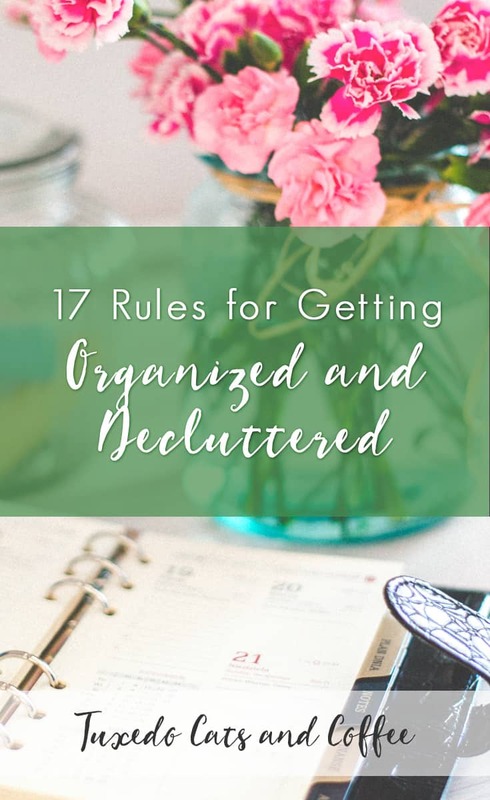 The other day I wrote about the idea of setting rules instead of goals … today I want to share 17 rules for getting organized and decluttered. Here are the rules I suggest — though I don’t suggest adopting them all, and especially not all at once. Try a few out, see how they work for you, then try a few others. 1. 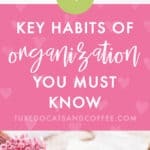 Get yourself organized at the start and end of a day. As you start your work day, write down your 3 Most Important Tasks (MITs). Write down a handful of other things you’d like to do today as well. Clear your desk, get things in order. At the end of each day, tidy things up, check off your list, maybe even get things ready for tomorrow. 2. When you get up from your desk, put one thing away. 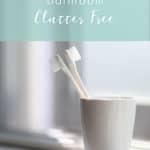 Whenever you get up for a glass of water, to go to the bathroom, to take a break … pick up something off your desk and put it away. If your desk is clear, look for something nearby. 3. When you’re done eating, wash your bowl. This is self-explanatory. Mindfully wash your dishes instead of leaving them in the sink. If there are other dishes in the sink, wash a few of them too. 4. Wipe down the sink when you use it. Whenever you wash your hands or brush your teeth in the bathroom, wipe down the sink so it’s clean. Do the same in the kitchen sink. Clear away a few things around the sink too if you can. 5. When you walk through a room, find one thing to put away. If you’re going from your bedroom to the living room, find one thing during that trip to put away. 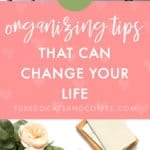 You don’t have to get stuck in putting everything away, just one thing. 6. When you take off a piece of clothing, put it away. When you shower or change clothes, instead of leaving them on the floor or on a piece of furniture, put the clothes away or in a hamper. Look for a few other clothes to put away too if there are more lying around. 7. Keep flat surfaces clear. Your tables, counters, desks, floors … keep them clear. If there’s a ton of clutter there now, see the rule below about decluttering on Saturdays. But if it’s doable, just start clearing whatever is on the floor (except furniture and the like). When you walk by the kitchen counter, look for things other than oft-used appliances to put away. 8. At the end of the work day, file stuff. If you still use papers, file them at the end of the day. If you are all digital, clear your computer desktop and put files where they belong. 9. Deal with an email instead of putting it off. When you open an email, give it the space to deal with it immediately. Read it, reply, take action, or archive it. 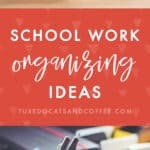 Or put it on your to-do list for later if it’s a big task. Don’t just constantly open emails without handling them. 10. Work to only having 3 emails in your inbox. Slowly clear away the hundreds or thousands of emails in your inbox. Archive or delete them, put a handful in a to-do folder, file others into informational folders, unsubscribe from newsletters. 11. Put non-essential items you want to buy on a 30-day list. Create a 30-day list, and whenever you want to buy something that’s not absolutely essential (other than groceries, cleaning supplies, toiletries), put it on the list with the date you added it. Then don’t allow yourself to buy anything until it’s been on the list for 30 days. At the end of the 30 days, see if you still want it before buying. 12. 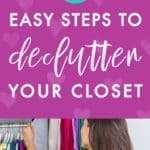 Put your clothes in a different closet or box, and only take out what you need. Move all your clothes to a closet in an unused room if you have one, or put them in a box or two. Only remove the clothes you really need to wear. After a month of doing this, you’ll see what clothes you can consider donating. 13. Declutter on Saturdays. 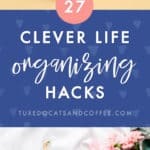 Every Saturday morning, spend an hour or two (or half a day) decluttering one area. 14. One in, two out. When you bring something new in your life (buy something online, get a gift), get rid of two other similar things. For example, if you buy a pair of shoes, donate two other pairs. In this way, you’ll 1) think more about each thing you buy, and 2) slowly have fewer and fewer possessions. Eventually you’ll want to switch to a “one in, one out” rule when you think your possessions are at a good level. 15. Limit how many things you have. Consider limiting yourself to 30 pieces of clothing, or 30 books, or something like that. Get rid of everything else, don’t allow yourself to go beyond the limit. The individual limit you set is up to you, whatever feels slightly uncomfortable is good. 16. 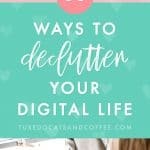 At the end of each month, clear out computer clutter. Self-explanatory. Back things up! 17. Every three months, purge. Also self-explanatory. Spend a weekend purging all your unneeded belongings.